If you grew up a fan of 90’s golden-era Nickelodeon, that tagline should be no stranger to you. … but bad news, if it is, man, you’re getting old. Voila! You now have Nickelodeon GUTS, the action sports competition that ran for four sweaty seasons on the kiddies’ cable network. Hosted by jolly comedic actor Mike O’ Malley, GUTS pitted three tween contestants against one another in several sporting events to win colored ranking medals. The grand prize was a “glowing” trophy– a piece of the “Aggro Crag”, the giant fabricated mountain that served as the game’s final obstacle race. This prize apparently was so mesmerizing, it made the contestants forget Nickelodeon wasn’t giving them any actual money. 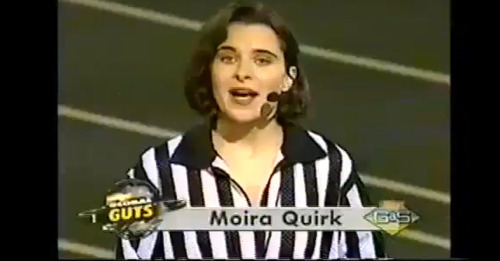 The kids were mildly adorable and goofball O’ Malley monopolized a majority of the screen time, but the real hidden GUTS-y gem was officiator/referee Moira “Mo” Quirk, owner of the most fun-to-impersonate accent to ever grace the channel. For all of us Yanks who grew up only knowing Moira as “Mo the Ref”, you’d best know that black and white-striped ref jersey is just the tip of the iceberg for this talented British comedian/actress. 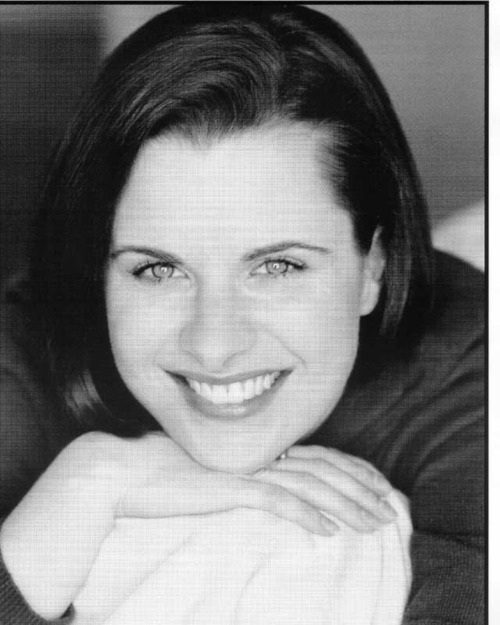 Moira has kept herself busy since the show’s ending in 1996. An established stand-up comedian who has also done extensive acting and voice-over work for shows such as Nickelodeon’s animated My Life as a Teenage Robot, the podcast series The Radio Adventures of Dr. Floyd, Johnny Bravo, Happy Feet Two, and several video games. You can currently catch Mo as the live-action host of the animated series Angelina Ballerina: The Next Steps and a number of upcoming projects. I was lucky enough to have Moira as my first-ever interview, and I couldn’t have asked for a better choice. Friendly, insightful, and always funny, we discussed that catchy-as-a-cold GUTS theme, conquering the rocky Crag, terrible British impressions, and what it’s like to be a Halloween costume. 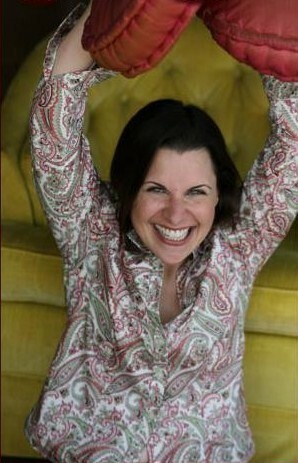 Please check out Mo’s official site, and follow her on Twitter at @moiraquirkable. Your funny-bone will send you a Hickory Farms sausage and cheese gift basket as a thank you. BLUMES: After seeing Nickelodeon revive their classic 90’s programming with their The 90’s Are All That!, do you ever take a moment to sit back and think that you were one of the most memorable faces from an era of television so many hold dear? MO: Maybe it’s because I’m English, but no! I’m completely incapable of thinking that way! But I do encounter many, many people who watched GUTS and are happy to meet me, and yes, that is nice to feel I was a happy part of their childhood. I once bumped into Billy Connelly and all I could do was say “Oh!” as I looked up at him, but I felt a rush of remembering my best friend and myself sneaking his albums from her father’s collection and listening to his quite naughty comedy and just laughing and giggling away secretly in her room. Of course, GUTS was not naughty or blue, but if I can elicit that same kind of “Oh!”, I’d say that’s quite nice. Do you ever get the GUTS theme song stuck in your head out of nowhere? Seriously, sometimes I get that thing in my head and it’s harder to get out than peanut butter from the roof of your mouth. Like an adventure hero who has inured himself to poison, it has no effect on me. Have you kept in touch with Mike ‘O Malley over the years? Ever caught any of his television shows? We do keep in touch. He’s busy with work and family. I’m busy with work and family, but we keep up with each other and I’m always happy to hear what he’s up to. I did watch the first season of Glee and thought he was amazing. A really touching performance- and Emmy nominated, I might add! 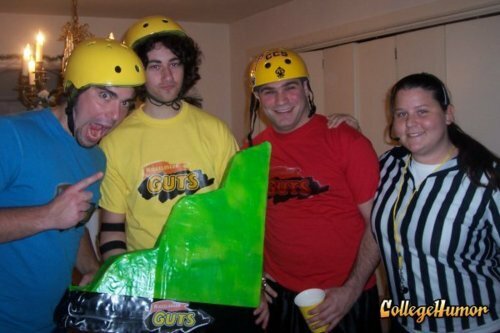 If you Google “Nickelodeon GUTS Halloween costume”, there’s many a photo of a group dressed as contestants, complete with a “Mo” ref. Now, I don’t know what it’s like to be a Halloween costume, unless “dorky white guy” becomes a popular costume next year. Is it as cool as I’m thinking it is? Yes, it is just that cool. Also, as a practical person, I like how easy it is to assemble: a ref shirt, some ’90s spandex bike shorts and if you have a short, British woman to put in there, all the better. In the years since GUTS, you’ve certainly amassed quite the impressive resume, including stand-up comedy, cartoon voice-over work, and acting in film, television and theater amongst other endeavors. Which has been your favorite to work on? I did once get to say “if it hadn’t been for you meddling kids!” as the villain on a Scooby Doo episode, and I walked on air for a week or two after that! Lately I have been performing in and recording a fair number of plays for radio and that is wonderful. When I was a teen listening to plays on BBC Radio 4, I thought life would be pretty magnificent if I could do that. Now, I do. I get to do all sorts of plays from Restoration to Angry Young Man for LA Theatreworks/NPR and for the BBC. It’s lovely. But, whether it’s a game or a cartoon or a sitcom or web series, I really love my job! Doing voice-over work for animation seems like a barrel of monkeys… are there any personal favorite cartoons you’d like to work on one day? I don’t even know if they are still in production, but Phineas and Ferb. I love that show! It is built on a foundation of kindness and silliness and it really makes me laugh. My pal Dee Baker (also a Nickelodeon alum) voices Perry. Who were your comedic inspirations growing up? Do you follow any current comedians? I have been lucky enough to see Zach Galifianakis when he was doing open mics years and years ago. I’ve seen Eddie Izzard. I would have loved to see Mitch Hedberg. I love Maria Bamford and Jackie Kashian. I think Catherine Tate is wonderful. There are all sorts of comedians I love. Eddie Pepitone and Frank Conniff always make me laugh. Wow, this is turning into a long- and obviously disjointed- list. When I was growing up we would always put in a Jasper Carrott tape in if we were going on a drive. He’s British and did story based comedy. Or some Monty Python. Coming to America and going through my husband and uncle’s record collections introduced me to Bob Newhart and Bill Cosby among others. Currently, I’m watching Louie (Louie C.K.) on Netflix. I think he’s pretty amazing. Funniest movie of all time??? GO! On your official site, you have a clip of your stand-up routine about Americans oddly imitating British accents. I am guilty of a pretty terrible one myself. Are we all that bad? Does every fake British accent mention tea? Cause that’s pretty much our go-to move. For ‘go to’ moves it’s not a bad one. I believe my husband wins the prize for best worst English accent. It makes me cry… laughing. 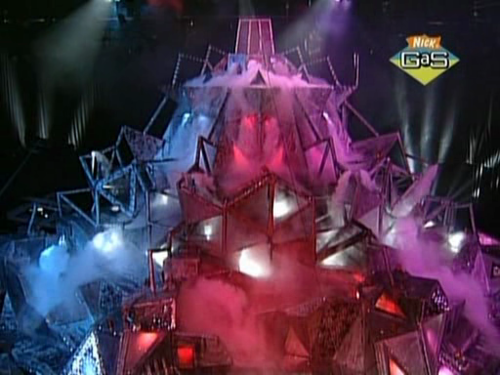 Now, a couple questions about the “Aggro Crag” on GUTS, did you ever get a chance to climb that thing? Due to my petrifying fear of heights, I’d make it about 10 feet up and freeze. I would’ve been shown in GUTS blooper reels. Did they ever give you one of the glowing green prize trophy pieces to keep? I did conquer the Crag. I do own a “piece of it.” It’s in the garage. Why did Dracula take cough medicine? If we started a campaign to get you on Dancing With the Stars in a future season, how do you think you’d fare? What’s going on in Mo-Land these days? What are your current projects where we can see/hear/laugh along? There’s a few actually. I’m in a new web series called “Dirty Work” . Check out this LA Times article. I’m in the third season of the web series “Pretty”. I recorded “Look Back in Anger” for LA Theatreworks, that has aired on various NPR stations nationwide. I’m currently recording an X-Com game playing a cold and clinical scientist. Star Wars: The Old Republic, The Elder Scrolls: Skyrim – I’ve been getting some nice feedback on those. I have big intentions with regard to social media! Maybe actually pay attention to Facebook, and updating my woefully outdated website and YouTube channel, and, oh, I don’t know, actually starting tweeting (@moiraquirkable). A big thank you to Moira Quirk for her time and for being a fantastic first interview on A Blumes With A View!